While neither as dramatic nor as literal as Benjamin Franklin's famous quote, Douglas G. Smith, FRBMA, made a similar point about radiology groups and hospitals at AHRA's 2015 annual meeting in Las Vegas in July. 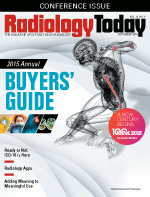 Smith, the managing partner of Integrated Medical Partners, suggested that radiology groups and hospital imaging departments must work together with a more unified purpose rather than pursuing competing objectives. Smith described health care as being a team sport and that radiologists and hospitals need to see each other as teammates rather than opponents, which he said is too often the case. The audience, composed largely of hospital imaging administrators, largely nodded in agreement. "We need [hospitals and radiology groups] to work as partners," Smith said. "There are things that hospitals understand about what's happening with populations and patients that the physicians don't. There are things that physicians know that hospitals don't have any visibility of—why don't we share that together? Why don't we manage this right to all our benefit?" Smith and his presentation partner Keith Chew, MHA, CMPE, managing director of strategic positioning and consulting services at Integrated Medical Partners, discussed how the two groups can better work together to help both succeed in a changing health care environment. One of Smith's points: Health care must overcome its fragmented nature. That is true. While there has been significant consolidation among health care providers, the industry culture reflects a patchwork of small companies, compared with other large industries. "[Health care] is too fragmented of an industry," Smith told the AHRA audience. "It is one of the least cohesive businesses in the United States economy. We all have these little fiefdoms going so there's no consolidation and we can't take advantage of economies of scale." I think Smith is absolutely right on this point; it also provides an opportunity to radiology groups. In a consolidating health care environment—hospital systems, medical groups, and insurers all are consolidating—radiology groups that take this approach are much more likely to remain on the inside after the next round of consolidation. If two hospital systems merge, the radiology group that proves its value and is perceived as well aligned with the hospital mission is likely to be the dominant group in the consolidated system, if not the surviving group. In this consolidation environment, groups can demonstrate their value by coordinating the standardization of imaging protocols over the organization, work with radiology colleagues to speak with one unified voice on imaging matters, strengthen the process of getting patients the right study at the right time—in addition to providing quality reads. This sense of partnership will become even more important if imaging migrates from a predominantly fee-for-service reimbursement, through bundled reimbursement, and on toward some even more value-based model where providers bear much greater financial risk. In a bundled payment world, providers will receive one payment for a defined episode and have to divide it among themselves. In that case, you definitely want your participation understood and valued. In recent years, imaging growth has flattened and radiology departments are less often the big driver of hospital profits. But with the swarm of baby boomers entering their peak health care consumption years, imaging demand isn't going away. Hospitals will still need to deliver imaging services and radiologists are still the people most capable of running an efficient, quality department. Hospitals want their radiologists to do that. Radiology groups that fill that partnership role are more likely to thrive by making themselves indispensible to hospitals—or at least a more attractive option than their competitors. Working as partner does not mean the radiologists must give up their independence. Radiologists who bring solutions for delivering quality imaging care to the hospitals are more likely to retain their hospital contracts. It might not always be the case, but most radiology groups lose their contracts only after problems have cropped up—and are not addressed. For the radiology groups, being seen as supporting the hospital's mission and not just providing exam reads and imaging oversight as part of a contract is a smart move.